Kohama Island is located about 2km east of Iriomote Island, between Ishigaki and Iriomote, and is separated by “Yonara waterway”, which is famous for Manta rays swimming through (common name is Manta way). Since rice cultivation was possible from ancient times, it has the rich tradition of agriculture in the Yaeyama district. 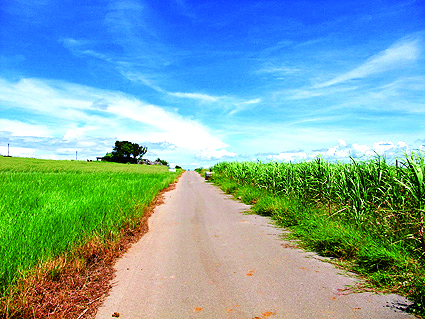 Sugarcane and rice are mainly cultivated now. A whole view of surrounding islands can be commanded from Ufudaki, which exists in the center. It also became the stage of NHK serial drama “Churasan” in 2001. The whole region and the csurrounding ocean area are specified as Iriomote National Park.